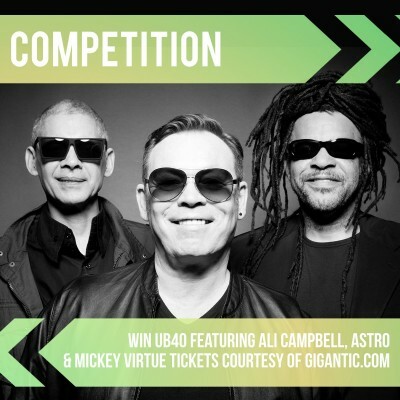 UB40 featuring Ali Campbell, Astro & Mickey Virtue are heading out on a huge outdoor 'Grandslam' tour this summer. The tour will see the band perform at some of the greatest and most prestigious outdoor venues in the UK, including cricket grounds, racecourses, sports stadiums and country parks. Each of these shows promises concertgoers a first-hand experience of an outdoor event, with the addition of a real festival vibe; the result of the unique Grandslam format of the tour. And we are delighted to be able to offer you an opportunity to win a pair of tickets to a venue of your choice. Just fill in your details and answer the question to be entered! Competition is now closed and the winner will be notified shortly. The competition closing date is 22nd May 2017 at 09:59, entries will not be accepted after this time. Winners will be contacted on the 22nd May 2017 to arrange redemption of free tickets. Tickets cannot be exchanged, there are no cash alternatives and no correspondence shall be entered into. Winners must be prepared to take part in any relevant publicity.